Internal audits (and external audits, too) have evolved over the past few years. Prior to ISO 9001:2000 this type of appraisal was generally limited to “say what you do”, “do what you say” and comply with the intent of the standard. The downside to this approach was that a company could manufacture a product that was essentially worthless in the marketplace and still be registered to the ISO standard. Fortunately this is no longer the case. The current version of the standard stresses effectiveness of your QMS processes, and this criterion as part of an internal audit. Imagine that… only 20 years into this standard and someone finally determined the importance of effectiveness! Effectiveness is defined as the extent to which planned activities are realized and planned results achieved. Or in simple English, does the process flow as it was designed (planned activity) and is the process achieving its goal (planned result)? Sounds simple… and actually it is. Most companies already have flow charts or work instructions that define process activities. An auditor follows the flow, determines if the process participants understand their part of the process, evaluates the process data, and that in a nutshell is the audit. Of course, there’s much more to it that detailed here, but that’s a discussion for another time. We want to focus on having an effective internal audit program. First, identify the processes using our example company key process flow. This defines which processes are required to be evaluated according to the standard. 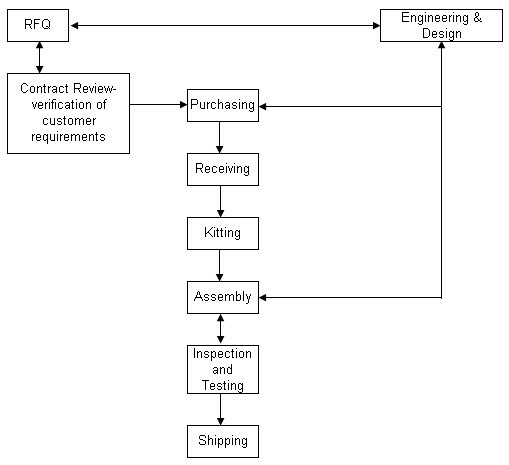 The example shows 9 key processes (or customer related processes per clause 7.2) beginning with the Request for Quote process and ending with Shipping. ISO 9001 requires you to plan the internal audit program, with regard to the importance of the process, how well the process has been performing, recent corrective/preventive action and previous evaluation results. So based on importance, the Engineering & Design process, and Assembly process are candidates for frequent evaluation. If historically the example company had multiple issues in Purchasing or Shipping, these processes would also be considered for frequent evaluations. Now you can create your schedule. Every process should be examined at least once during each audit cycle (usually a calendar or fiscal year). All that’s left is to make this appraisal value-added… Say What? Make the audit value-added? Indeed, you can, if you consider value-added from a slightly different perspective. Normally value-added means a task a customer is willing to pay for. A task that helps to generate revenue for your organization. It adds to the bottom line. A good auditor, creating value during a process evaluation, will identify improvement opportunities; determine wasteful or redundant process steps and add these comments to their final report. This provides your company the option of saving money as a result of your suggestions. Doesn’t this also add to your company’s bottom line?